Disclosure: This post and giveaway is sponsored by Upper Darby Performing Arts Center. I received no monetary compensation for this post. All opinions are my own. Over the past few weeks I have been so excited to share with you all of the awesome shows being presented by Upper Darby’s Summer Stage this summer at Upper Darby Performing Arts Center. Yesterday my kids and I attended Freckleface Strawberry the Musical and we absolutely loved the show! Be sure to check out our review HERE. Next up for Summer Stage is “A Year With Frog and Toad” featuring the well-loved characters from Arnold Lobel’s classic children’s book. Performances are on August 7th, 8th, and 9th at 10:30 am and on August 8 at 7:30 pm. The show is approximately 70 minutes and is ideal for ages 4 and up. Once again, this is a fun and affordable way to take the kids to a show and introduce them to the wonder and delight of onstage performances. Tickets are just $6 – $9 and may be purchased at the Box Office, by calling 610.622.1189 or online at www.udpac.org. In addition, parking is free and easily accessible to the theater entrance. For those with younger children, free babysitting is offered onsite at the theater for those too young to enjoy the show. 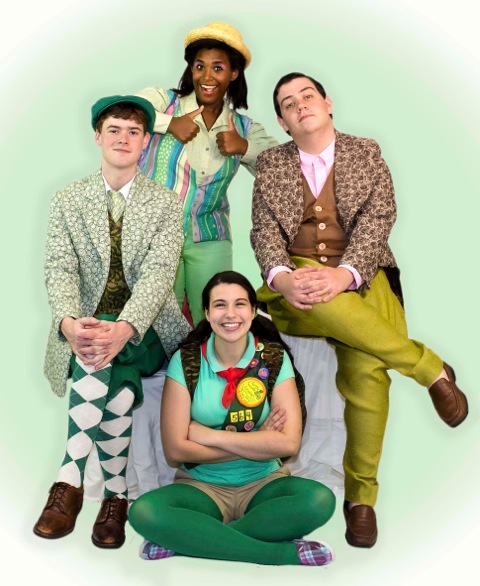 “A Year with Frog and Toad” is a whimsical show that follows two great friends – the cheerful, popular Frog (Brandon Skahill of Springfield) and the rather grumpy yet charismatic Toad (Matt Strahan of Bala Cynwyd) – through four, fun-filled seasons. On a woodland adventure, they meet an entire host of wonderful characters including Snail (Sierra Wilson of Upper Darby) and Turtle (Olivia Bell of Havertown). Part vaudeville, part make-believe, and all charm, “A Year with Frog and Toad” tells the story of a friendship that endures, weathering all seasons. The jazzy, upbeat score makes it a delightful musical for the entire family. What a wonderful storyline and a great lesson for adults and children alike about the love and value of friendship and how it can transcend all things – age, gender and race included. Children are invited to come early for pre-show activities before the morning performances and stay after the show to meet the cast members! My kids absolutely loved the before and after activities when we recently visited and I was so impressed at how the cast interacted with the children, answering their questions and thanking them for coming to the show. If you have not yet visited Upper Darby Performing Arts Center or you are a frequent visitor to the shows, here is a perfect opportunity to enjoy a fantastic show! Thanks to the generosity of Upper Darby Performing Arts Center, Delco Deal Diva is giving away one family 4 pack of tickets for the 10:30 AM show on Thursday August 8th. For your chance to win, simply fill out the easy Rafflecopter form below. Winner will be drawn on Monday August 5th . Good Luck! we are looking forward to seeing Willy Wonka Jr and we loved The Little Mermaid. I would love to see Willy Wonka, Jr! I didn’t realize they have been doing this since 1976! 1976?? Wow! I had no idea. Jessica recently posted…Stop the Jenny McCarthy Bashing! My daughter would love to see The Little Mermaid!